An interesting thing happens to you if you study a particular field of astronomy for long enough. Certain things become familiar to you. Catalogue numbers like HD 44179 or IRC+10216° become commonplace, and the strings of numbers and letters which, at first glance, seem baffling start to become as easily readable as street addresses. 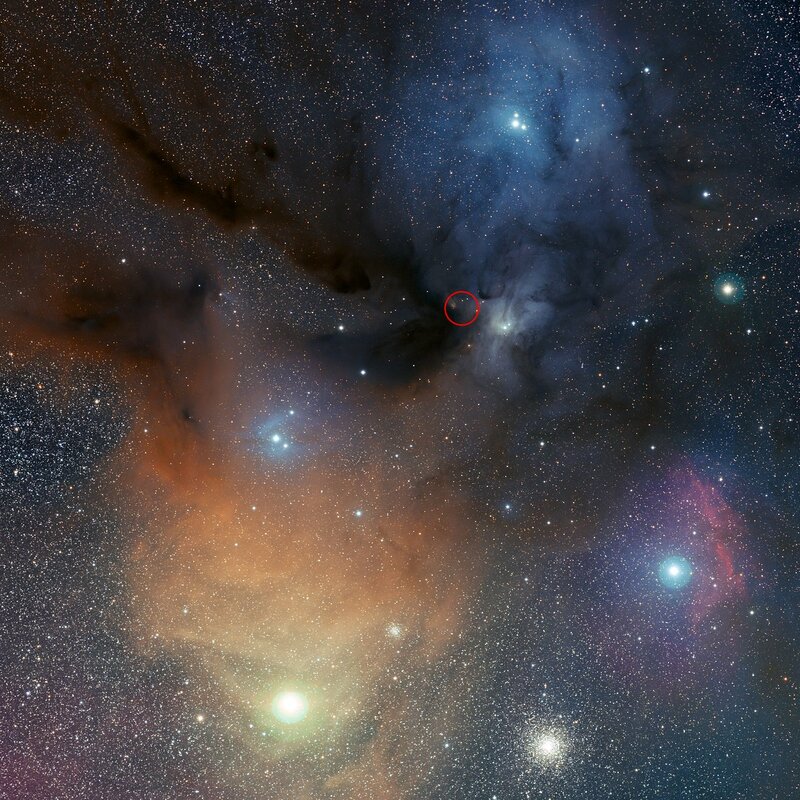 Without even setting out to do so, you memorise the most interesting and relevant objects in the sky, and for me one of the most interesting happens to be Rho Ophiuci (ρ Oph). Rho Ophiuci is a star in the midst of a region full of extravagantly coloured swirling clouds of cold interstellar gas. Not only is a beautiful sight, but it’s an astrochemists dream, full of all sorts of interesting molecules — as well as being rich in those ever-elusive Diffuse Interstellar Bands. But this latest discovery is not seen in optical light. Instead it’s visible in microwaves. Astronomers using the Atacama Pathfinder Experiment telescope (APEX) in Chile set their sights on the small area circled in red in that image up there, and found hydrogen peroxide! That would be a disproportionation reaction, and it’s the reason why you should never leave a closed bottle of bleach on a shelf in your bathroom after dying your hair.★ Alternatively, a single hydrogen molecule would be enough to break it into two water molecules. So it’s not going to exist in diffuse regions of space where the UV photons would shatter it to pieces, and it wouldn’t last long in dense interstellar clouds either where marauding H2 molecules would react viciously with it. So where exactly did it come from? Well, according to this followup paper, soon to appear in the journal A&A Letters, the hydrogen peroxide molecule was predicted by a set of astrochemical models about gas-grain chemistry. Essentially, hydrogen peroxide is created on the surfaces of interstellar dust grains. This is quite exciting and, I must say, relevant to my interests. I’ve sat through a lot of talks on astrochemical models, and those modellers do some marvellous work. Evidently, the models are doing their job very well if they can predict the presence of such an unlikely molecule in interstellar space! A smile and a wave to the source of both the story and images, ESO press releases! The papers are Bergman et al (2012) in A&A Letters and Parise et al (2012) on arXiv. ★ Yes I have made this mistake before. This entry was posted in Imported from Livejournal and tagged astrochemistry, interstellar medium, molecules. Bookmark the permalink.